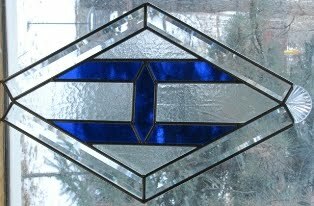 Doors From Dishes: Getting Started: Let's talk about building a window! Getting Started: Let's talk about building a window! 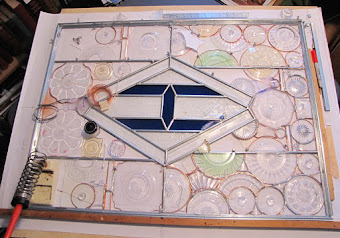 It seems as though I'll be building an incredible set of window panels out of my favorite collectible: Heisey dishes. What a project! What a dream come true! What a mechanical nightmare! The first thing that comes to mind is the nature of the material I'll be working with. 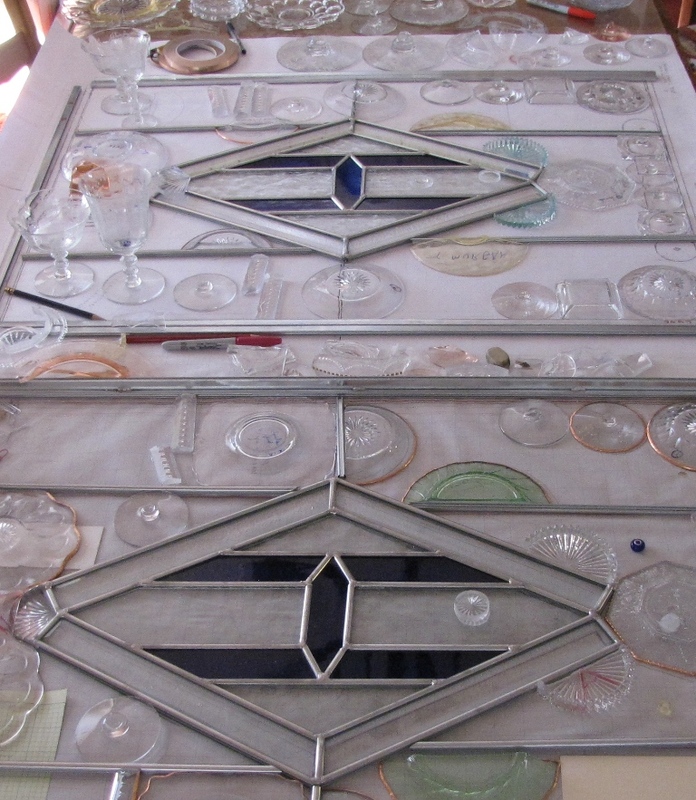 There will be a need to allow for various thicknesses of glass pieces. Just look at the diversity of glass in the Heisey repetoire: Greek Key, Lariat loops, Ridgely's Ridges (to name a paltry few). Think of all the thicknesses involved in each shape too! Between plates and cups and bowls and goblets a single piece, when broken, can yield thick bases or thin slopes, slightly curved pieces or strong right angles. 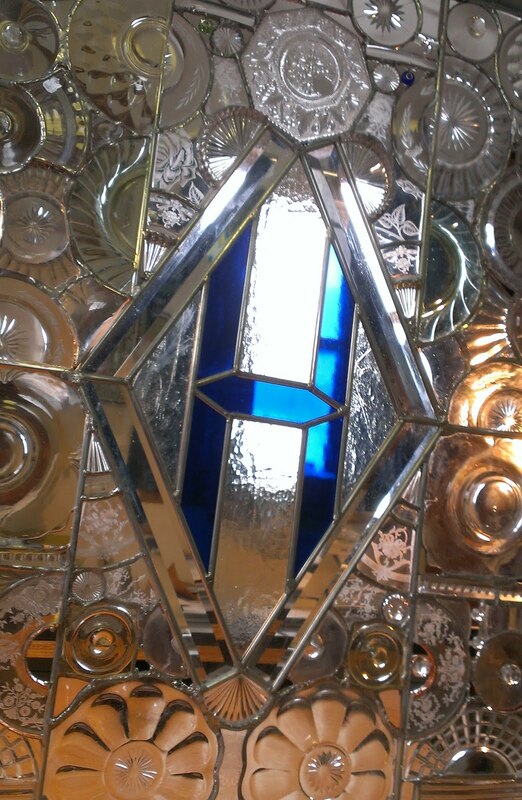 Imagine the beauty of half a goblet in a stained glass window - but how to "harvest" that half? On a cup that's already engraved, the glass will insist on breaking along the engraving instead of the clear spaces where I want it to break. 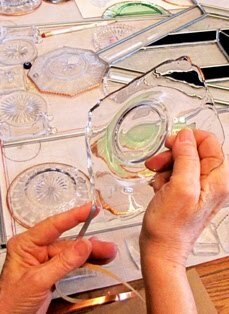 On a cup with multiple thicknesses or a champagne glass with lovely bulbs in the stem, I can't possibly use my standard techniques for cutting glass to size. I'm going to have to get really creative for this project. It's going to be quite a challenge! 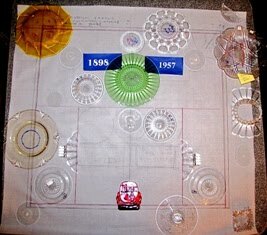 At first blush, and after several visits to the final installation site, I have my measurements for the completed panels. I'll be building two panels for each door, one panel above and one below the push-bar that will be located in the center where those sorts of things normally go (a door's gotta' open, after all). 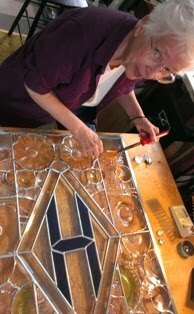 Standard stained glass panels are 3/8” thick but these panels are obviously going to be much deeper and "three dimensional"; possibly up to ½”. Then we must consider the space allowed in sealing the panels, as we are legally bound to put plate glass on either side of the door panels, so that means additional depth must be anticipated within the mounting space in the doors. Four panels. Two doors. A pile of the most beautiful Heisey I've ever seen. Of course, all the glass I'll be dealing with is already broken. 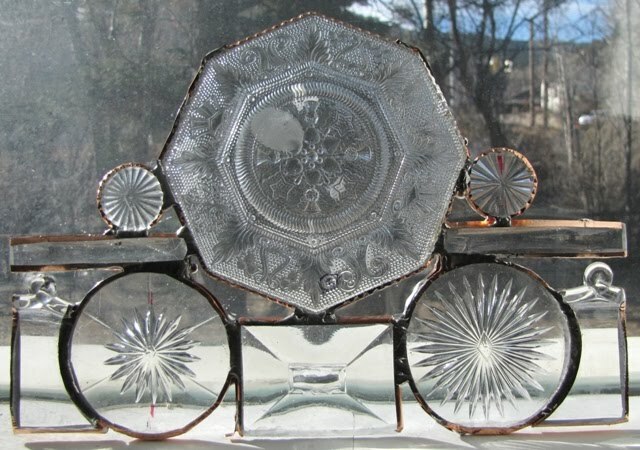 But, isn't it always a pleasure to simply hold a piece of well made glass, or to just stare at a piece of a beautifully engraved pattern, regardless of the "perfection" of the whole piece? And what fun it will be to put these broken pieces together into an unbroken whole. There's real poetry in that. Don't you think? As I move forward, I will be carefully considering my technique. 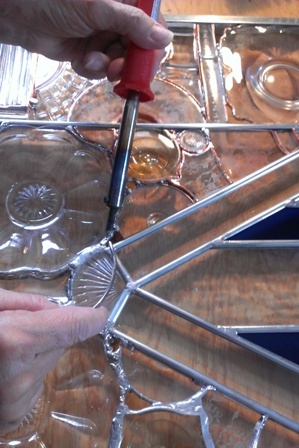 The best assembly technique for the Heisey glass pieces will be the foil method (L. C. Tiffany’s system) in which each piece is individually wrapped in foil and soldered along the entire length of each “line”. Variations in depth are easily accounted for in this method. Hopefully I'll figure out a way to add additional structural support with some reinforced lead and zinc "calming" (Cay-ming). My head is swimming with possibilities. I can't wait to start playing with broken Heisey and start bringing this project to life!